Former Valley’s-based cabbie James Jones, who has run his own taxi firm for the past four years, has now started his own plumbing business in partnership with his cousin, part time fireman Robert Clarke. 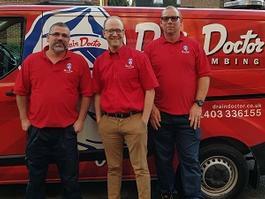 Neighborly, the world’s largest franchisor of home service brands, has enjoyed a bumper start to 2019 by adding three new franchisees to its Drain Doctor network, bringing the number of locally-owned and operated franchise locations across the UK to 55. During these uncertain times you need a business model that you can rely on to deliver consistent growth and substantial returns. The Drain Doctor business model has proven itself to excel in even the harshest economic climates to deliver impressive returns for its franchise operators. Established in the US in 1990 and bought to the UK in 1993, Drain Doctor has become on of the best-known names in the UK plumbing and drainage market. Providing essential 24/7 emergency plumbing and drainage services to both the domestic and commercial marketplace Drain Doctor offers a widely recognised brand in a stable industry. With franchisees that are achieving annual turnovers of £2million+, it is no surprise that there are only a handful of Drain Doctor franchise areas remaining with interest the brand doubling throughout the start of 2019 compared to the same period last year! Drain Doctor is a management franchise therefore, as a franchise owner, you will not be expected to complete any of the plumbing and drainage work yourself. Instead, you will direct your team of technicians ensuring that your business delivers excellent customer service to clients and maintaining a path for growth within your franchise area. With the support of your dedicated franchise consultant, you will make key business decisions to grow a successful Drain Doctor branch. As an established brand, Drain Doctor has developed various key initiatives to enhance the workflow for its franchisees. Our head office team develops the relationship with key corporate accounts to provide you with additional work free of charge. In addition to our national account work, you will have access to our in-house marketing team that works alongside you to create local and national marketing campaigns. Drain Doctor is a valued part of the Neighbourly group, an international collection of esteemed franchise brands. Supporting 3,700 franchise owners in 9 different countries Neighbourly has built a community of home service experts in the UK and beyond. Drain Doctor territories are becoming increasingly limited. A new Drain Doctor franchise territory requires an average total investment of approximately £70,000 + VAT. This includes: the franchise fee and working capital to see you through to your breakeven point. We have strong relationships with lenders who will finance up to 70% of your investment, subject to status. By filling in the form below you will be able to receive a copy of the Drain Doctor prospectus.